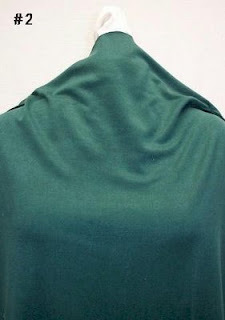 With even more draped cowl patterns like this one from McCalls appearing in recent pattern catalogs, this revisit of a popular tutorial I wrote a few years ago is even more relevant today. 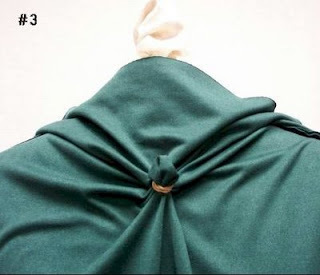 So, now I'll show you how quick and easy it is to make countless variations like these shown below from a basic draped cowl neckline...that can be done in mere minutes! 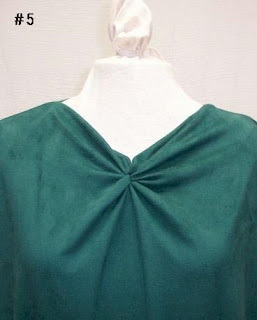 First, start with a drape-front cowl (photo #1 below) already in your wardrobe, or make one with the many patterns that exist for this style. 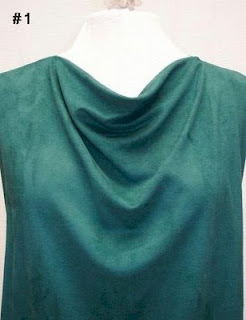 As shown In photo #2, turn the garment inside out and flip the front facing up to expose the wrong side of front of the top. 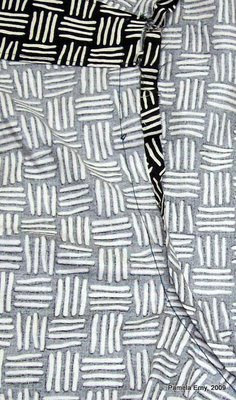 As shown in photo #5 below, when the garment is turned right-side-out, the twisted detail becomes a new interesting design feature of the top. Where you pinch and band the fabric is totally up to you: higher, lower, to the left or right of center, using 2 or 3 twists, etc. 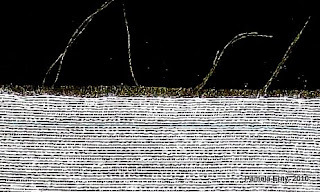 There are infinite possibilities for design variations like these.... Have fun! There are many ways to grade seams. Among them are trimming one seam allowance narrower than the other, turning the scissors on edge to "bevel" the allowances, and using Pinking Shears. But the hands-down most elegant and effective way I was ever shown, is to "Ravel Grade". 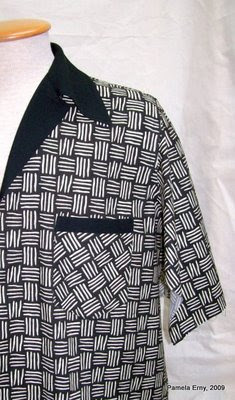 This was the favored technique taught to me by my Master Tailor mentors during my apprenticeship. 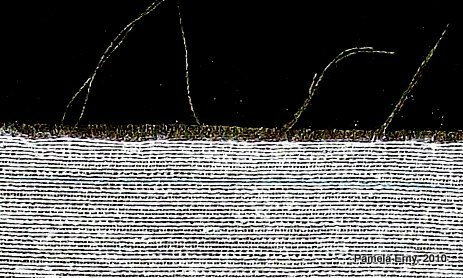 You are unlikely to find this technique in any tailoring books, as it is a very esoteric "old world" technique. 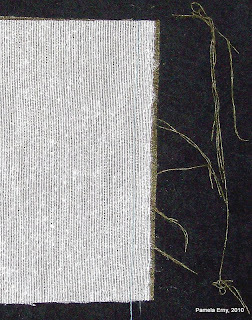 Below you will see a photo of 2 pieces of wool, that have been underlined with Pro-Weft Fusible Interfacing to within 3/16-inch of the seam edges. 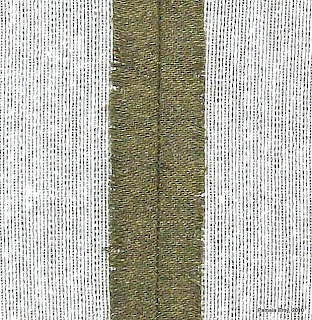 The 2 pieces of wool have been placed right sides together, and you can see (very faintly in blue), that a 5/8" seam has been sewn down the length of the two pieces, on the right. The first and only step in the "Ravel Grading" process is very easy. 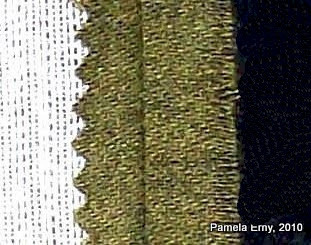 Merely ravel off a few threads from the edge of both seam allowances, leaving soft fringed edges. So what does that accomplish? 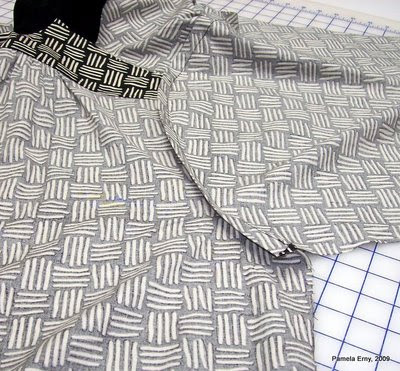 In this example, by completely removing the warp (lengthwise) thread from the seam allowance edges...the fabric there is now half as thick as before! 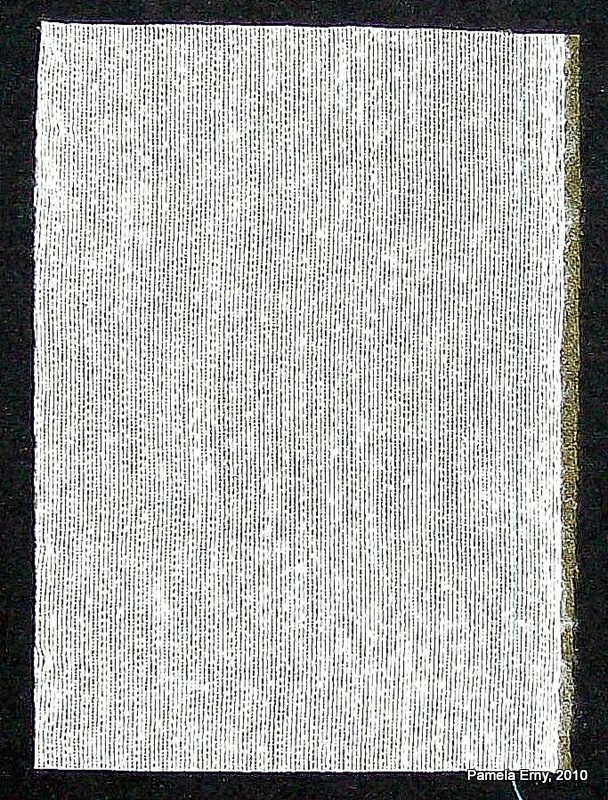 NOTE--Both seam allowances will be trimmed to 3/8" in some areas like lapel edges and jacket fronts before being Ravel Graded, and will remain "married" (not pressed open). 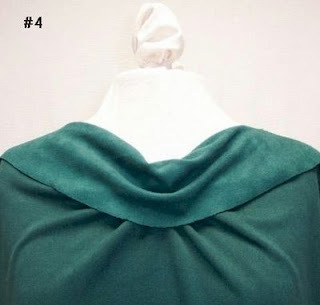 But instead of being the thickness of 2 layers of fabric, one layer has been raveled away resulting in the edge-bulk being totally eliminated...the finished lapel and jacket front edges (collar edges, etc) will be sharp and completely flat after pressing. 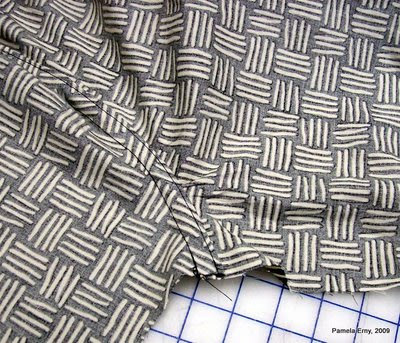 SEWING NOTES: Medium weight wool flannel fabric is underlined with Pro-Weft Fusible Interfacing, a very lightweight highly flexible interfacing available exclusively at Fashion Sewing Supply. 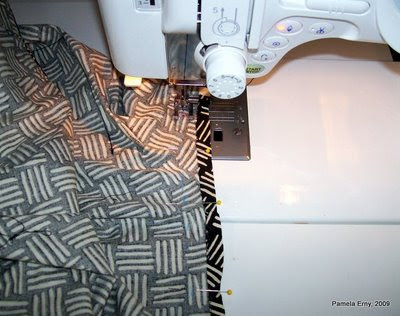 Since I am unable to sew because of my health, and because I have so many new blog followers since I first published this tutorial, I thought it was due for a "revisit". Progress on the Vintage Mens Shirt continues! Now the sleeves are sewn...and I thought you might be interested in seeing how these sleeves are drafted and set. It is done differently than most methods seen in modern printed patterns. 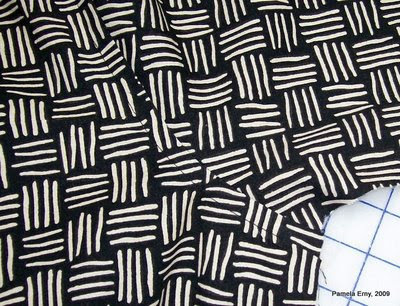 Take a look at these pattern pieces. I've marked the stitching lines so that you can see that the sleeve seam allowance is twice as wide as the corresponding seam on the shirt back (and front, not shown). 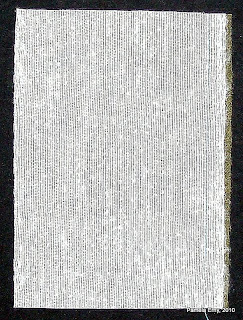 The seam allowance of the sleeve is 1", and the armscye seam allowance is 1/2". As you can see in the photo below, when the stitching line of the sleeve and armscye are matched (right sides together), the sleeve cap allowance extends beyond that of the shirt. 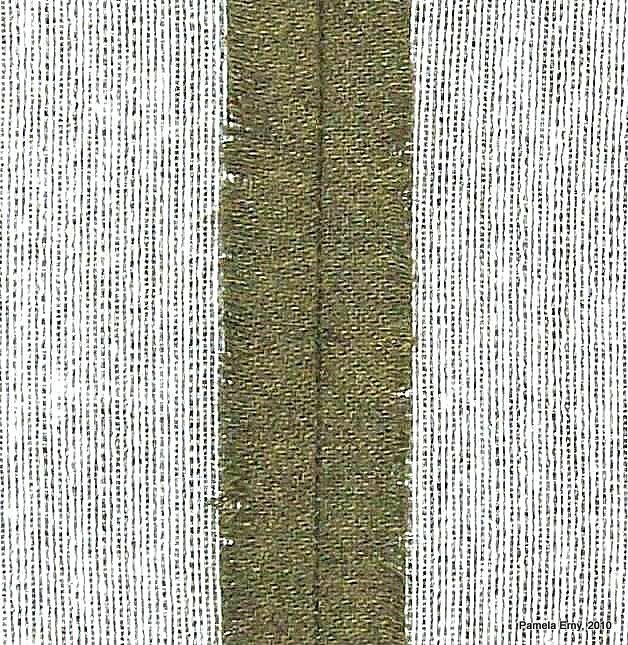 The sleeve is set by stitching along the stitching line of the armscye. It's much easier to do if you first mark the 1/2" seam allowance as you can see by the blue lines. When you've set sleeves this way several times, you can just do it by sight. In fact, when I hand-draft shirts, I almost always draft the sleeve allowance at twice the width of the armscye allowance. Here is the sleeve set into the armscye, from the wrong side. Because the sleeve seam allowance is wider, it is "auto-magically" ready to be felled...with no trimming needed! 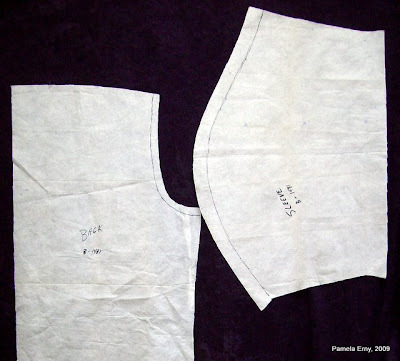 To begin felling the seam, just fold and press the larger (wide) sleeve seam allowance over the smaller (narrow) one, enclosing it. 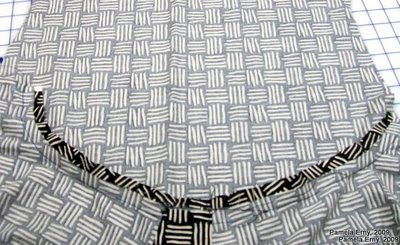 In the lower portion of photo below, the larger seam allowance is folded over the smaller, and still open near the top of the photo. When the sleeve allowance is completely pressed over the armscyce allowance... next press BOTH allowances towards the shirt. Look...an "instant" felled seam ! All that remains to finish setting the sleeves is to topstitch a scant 1/2" away from the well of the seam from the RIGHT SIDE, through all layers....as shown below. 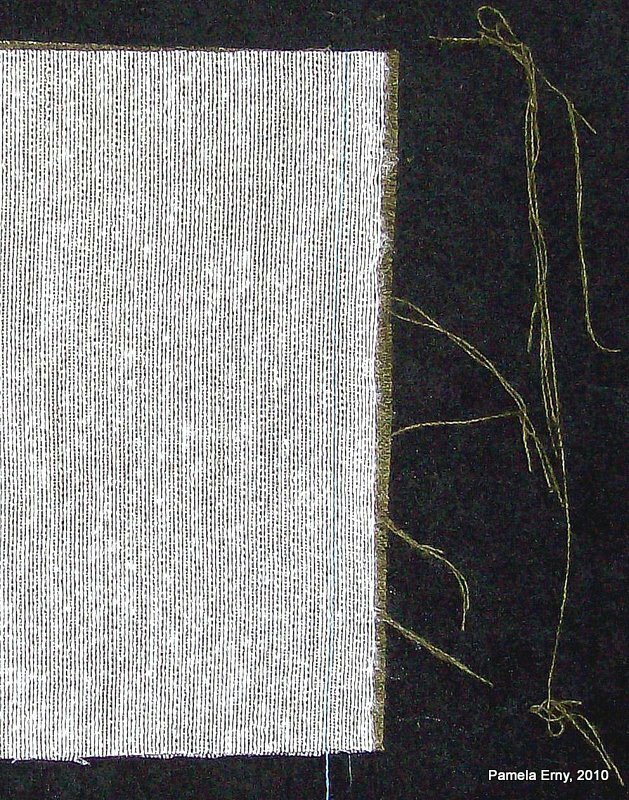 And this is how the felled sleeve seam looks from the wrong side, after the topstitching is complete. Nice and smooth, neat and easy...with no raw edges.